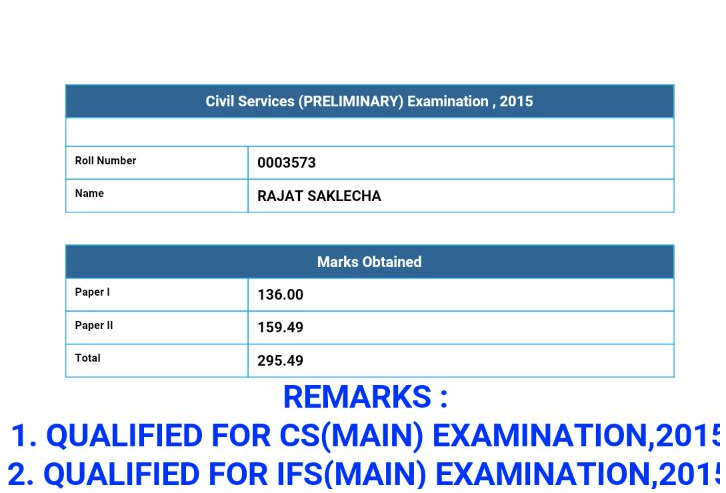 Rajat Saklecha, Rank 141 is here with his experience but not in the form of any traditional strategy. He has his own way of doing this. So humble by nature that he has always said ‘This time luck has been with me more than anyone else’ but its his sheer hard work that has worked. His simplicity and humbleness, traits to be inculcated by everyone. Firstly, I represent those who can’t even dream of studying 12-15 hours daily! Secondly, I am also not one of those jinke liye IAS, IPS jeevan-maran-paran ka sawaal hota hai. If not these services, papa roti nahi denge, companies naukari nahi degi, apni shaadi nahi hogi, mera kya hoga…— Na na – itna daroge to ban ke bhi kuch nahi kar paaoge Madam jee’s & Sir jee’s, aap log! So for me, the idea of joining services was always there since my school days because apne ko naa bachpan se akhbaar padhne ka chaska hai. 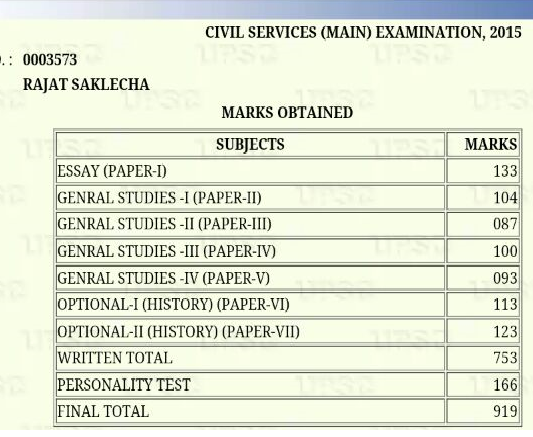 Kahan kya ho raha hai, kaun kya ban raha hai, sab maalum hona (that’s why I never feared Prelims, idhar udhar se taar jod-juda kar sab kar aate the GS mein. I scored 125 and 136, out of 200 in last two attempts). So, I am writing this not to tell you what to read and from where. Everyone knows that and here, on IASbaba, many toppers have beautifully explained the same. I am here just to ask you to free yourself. You are not like the hens in a coop which are taken out by UPSC in every August and December to butcher. I am just writing a few things which I did. This may not pass the test of the well established gold standards which have been set for every aspirant to follow. I remained my natural self, did what I have always been doing and succeeded a bit. You brought Yojana, Kurushetra, World Focus, Frontline and what-not- to your dens and kept piling them up. They are now giving you jitters ki “humse naa ho paaega”, to MAT KARO NA YAAR! Yojana ko side mein rakh, saare materials Popular ke saamne waale pohe waale ko dedo—ek plate pohe to de hi dega. After that, start looking for articles in Yojana which you find useful. Bas uss ek din jamaa kar baith jaao, preferably with a friend, and divide all the Yojana’s amongst yourself. Make notes and exchange. And the same applies to everything which you have been keeping pending for months now. Photocopies from all those newly popped up bookstores attract aspirants like hot cakes, but these cakes become tasteless as soon as they reach rooms. What I would like to say is that kam khareedo, bahut soch kar khareedo ,damdaar cheej kareedo aur padh daalo. Sasti mil rahi toh lelo? Aisa mat karna bhaaiyo, mehenga padhega! I preferred offline notes, although I think online is better because jaroori nahi naa ki ek hi attempt mein ho jaaye. Online notes won’t scare the hell out of you in next attempts as they are not bulky to see, as compared to registers. It’s all psychology! Jyaada dikhega to padh nahi paaoge, aur padh nahi paaoge to yehi laga rahega ki iss saal bhi nahi hoga, padh nahi paaye. Although, there is always a shortcut and you can read compilations but that won’t give you the confidence in exams. And when you lose confidence, you start losing your chances to complete the paper and bas lag jaayegi phir se! Reading answers just can’t replace writing. Write, get reviewed, review other answers and repeat. This exam not only checks your knowledge which you can rattofy by reading, but also your way of presenting that rattofied version. I have seen many good writers sailing through without much knowledge and many knowledgeable persons fail as they couldn’t write well. So, write as much as you can and write right now. Defeat that traction which is pulling you away from doing it, NOW. Whenever in doubt, run. Whenever in depression and tears, run. Sweat out the whole negativity. Sharma uncle, Kapoor saheb aur Sweety aunty ko waise bhi jeevan mein koi aur kaam hai nahi toh aap bhi unki na sune, unko samajhne ke bajay padho aur mast raho. Jo hoga , accha hoga! Kul jamaa baat yeh hai ki UPSC naam ki diamond shop mein bahut saare johari baithte hai. Aapki value pehchaan lene waala johari kab milega, ye koi nahi jaanta. Aapka kaam hai chamakna, chamakte raho, itna ki koi bhi johari aapko avoid hi naa kar sake! Post script, but equally important: With Tauseef bhai urf IASbaba at helm, this website will definitely help many more aspirants achieve ‘nirvana’. I have spoken to him a few times and loved his vigor to do something worthwhile for the aspirants. People like him are changing the civil service preparation process by helping out students from far flung villages, having very few economic means. And IASbaba’s presence in less than a year, not only online but in our lives is a testimony for it. Isn’t it? Kudos to him and whole IASbaba Team for simplifying lives!